If you operate a small business, it's helpful to keep personal and business expenses separate. That's why many business owners have at least two credit cards -- one for business and the other for personal use. But it pays to give some thought to each one. Some cards will reward personal spending and some are better when it comes to buying things for a business. To sort them out, card comparison site CreditCards.com has picked what it says are 2017's best business credit cards. It ended up with three top choices. Topping the list is the Chase Ink Business Preferred card. It's new to the lineup, introduced late last year with a generous sign-up bonus and offering lots of points on common expenses. The authors of the report gave the card high marks for its rewards program and sign-up bonus, which includes 80,000 points after you spend $3,000 in the first three months the card is active. Even though the card carries a $95 annual fee, the authors say the rewards more than cover it. The card also doles out triple points on a wide range of business-related expenses like shipping, internet, phone, cable, and travel. It even pays three points for every dollar spent on social media and search engine advertising. The Capital One Spark Cash for Business card is another favorite. It provides 2% cash back on every purchase and has a rewards program that is easy to use. "The card's flat rewards rate saves precious time that business owners might otherwise have to spend learning how to navigate a card's complicated rewards program," the authors write. "It also offers a relatively generous $500 sign-up bonus for spending $4,500 in the first three months, business-friendly benefits such as free employee cards, downloadable purchase records and no foreign transaction fees." Third on the list is the Starwood Preferred Guest Business card from American Express. This is an especially attractive choice if your business requires a lot of travel. 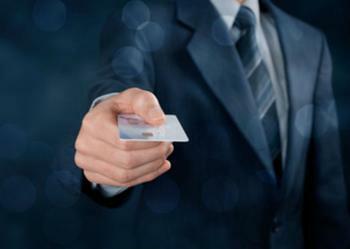 It might lack the number of earning opportunities as other business rewards cards, but CreditCards.com argues that Starpoints are "significantly more valuable" than other credit card rewards points. Starwood has also increased the value of its points by offering one-to-one transfers with several travel partners. The card hands out a 5,000-point bonus when transferring points. When signing up, cardholders get an extra 25,000 points if they charge $5,000 in the first three months the account is active. If they spend another $3,000 over the following three months, they are rewarded with an additional 10,000 points.